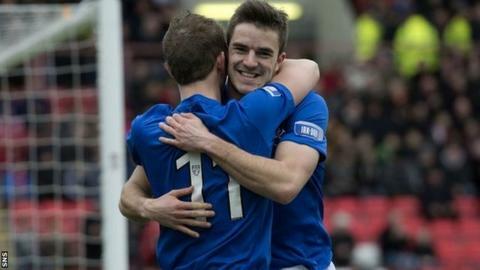 Rangers strengthened their grip on the Third Division with a very comfortable victory away to Clyde. Two goals from Andy Little set Rangers on their way, and a stunning strike from David Templeton made it 3-0 at half-time. Kevin Watt pulled a goal back just after the interval for the home side. But another strike from Templeton ensured the Ibrox side would take home all three points. Rangers, who announced before kick-off that Kal Naismith had signed a new two-year contract, looked dangerous right from the off, with Templeton causing early consternation for the Clyde defence. And the 5,000 or so Rangers fans packed into Broadwood only had to wait until the eighth minute to see their side score the opening goal. Dean Shiels was the creator, holding off Clyde defenders before crossing for Little to calmly slotted past Clyde keeper Andy Barclay. Rangers almost went two in front in the 18th minute but Ian Black could only direct his header over the bar following a Templeton corner. Templeton was causing Clyde plenty of problems and fired wide from 20 yards. But Rangers soon doubled their advantage. Great skill from Little saw the striker break into the box before firing high into the net. Clyde were offering little in the way of resistance or attack, and just before half-time the match looked all but over as Templeton scored a stunning goal. The former Hearts man picked the ball up midway inside the Clyde half and unleashed a 30-yard shot into the top corner, via the post. However, Clyde reduced their arrears just after the break. Watt showed some great poaching skill to convert a cross from the left. It was about the first time Clyde had really threatened the Rangers goal, and suddenly it looked like their might be a twist in the tale. But Rangers regained their composure, and again Templeton was the star man for the Ibrox side. The winger jinked into the penalty box before firing another fine strike into the far corner. Clyde showed plenty of spirit without ever really threatening Neil Alexander's goal as Rangers maintained their 22-point lead at the top of the league. You can follow Jonathan Sutherland on Twitter.